Miyuki from Japan, little “Japanese Channel Queen” with 7 crossings now, was also waiting for favourable conditions to attempt her first double crossing. I had the pleasure of meeting her (and her friend Margit Bonhoff) and swim with her in Dover harbour last year. She is sweet, humble, funny and “totally crazy” about the Channel (in her own words). But for days and days the weather did not offer a larger window for a 2-way swim. Afraid to have to fly back to Japan without even getting her feet wet, she finally went out in less than perfect conditions shortly after midnight on August 3rd with Neil Streeter as her pilot, Alison (Queen of the Channel) Streeter’s brother. While she completed 5 of her 6 previous solos in 14 hours or less, she would need 17 hours 18 min for the first leg this year with the wind against her most of the time. Determined to not give up, she still turned round after touching French ground to give her all to the second leg, even though the prospects were not encouraging at all and she had to swim through the night again. She swam valiantly for a total of 29.5 hours, refusing to give in to tiredness, feelings of hoplessness, the cold etc., but had to be taken out of the water after getting a bad cramp in her leg a few miles away from Dover. complete the two-way crossing, not just one way, as no Japanese person has ever successfully swum the two-way Channel crossing. opportunity to swim the one-way. I swam for 17hours 35minutes but had to give up just 3km from the French coast. My respected Freda then gave me some good advice, “When you swim the Channel crossing, you shouldn’t look ahead. It makes you feel as if your goal is very far away and that you still have much further to swim so it is mentally harder to keep going. Also, you shouldn’t stop because by doing this you will be drifted by the tide and have to swim further. You shouldn’t do anything which will be disadvantageous to you. You should try the one way swim again.” It was in 2004. 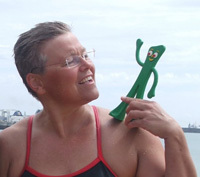 The next year, I began training again for the one-way swim and followed Freda’s advice. Since then, I have successfully completed the one way crossing six times. This year, I went back to Dover again. I felt ready for to attempt the two-way swim. I planned to stay in Dover for 35 days and waited nervously for the big day. Neil, the boat pilot, would choose the day with the best weather conditions for the swim. The other swimmers had gone to swim one after another and everybody kept asking me when I was going to swim but the days passed and I still had no idea when I would get to swim. I started to feel very frustrated but I could not do anything but wait and trust Neil to pick a good day. For the two-way swim, we would need two consecutive fine days. It was possible that the weather conditions would not permit me to swim because the weather was constantly changing. I told Neil that if the two-way was not possible, I still intended to swim at least one way before flying back to Japan. At last, one week before I was due to leave England and go back to Japan, Freda told me that I would be able to swim on the next Monday or Tuesday. I was so happy because I had been waiting such a long time for this chance and could not stop crying. On Monday, I was on the beach with Jenni, an observer when Neil called her to say that we should all meet at the marina at 19:00 that evening for my two-way challenge! I was overjoyed. I was going to attempt the two way swim! I was so pleased that Jenni would also be coming on the boat with me as my observer. I got my thing ready for the swim, had a massage and went to bed for a nap. At last the time for my big challenge had come! Our boat was called Suva. Once on board, I applied the Channel grease to my body. When the boat came close to Shakespeare Beach, Ishii, my coach farted. Everybody on the ship started to laugh and the atmosphere became very relaxed. Even when I was swimming in the dark, I remembered it and laughed. It was nice to have a funny thought to make me smile whilst I was swimming, particularly when it became dark. That night I started swimming from Shakespeare Beach. I was familiar with the currents around the beach from my previous swims but, for some reason, on this occasion I kept drifting so that every time I looked up I saw the same scenery. I worried that I might not be moving forward at all and was scared by a big red jelly fish that brushed my arm, stinging me. After about 40 minutes, saltwater filled my goggles. I had already tested the goggles in the water but the waves pushed the water in. My eyes started to sting. I knew from my previous experiences that the eyes are very important to a long distance swimmer so I changed my goggles when I stopped for my feeding. I am used to swimming at night but I still felt sleepy. Suddenly, I was surprised by some people screaming. They were a relay team who had already finished their swim and were on the way back to Dover. Their support encouraged me a lot. towards France and the currents are very fast. Morning came and as it got brighter, I began to wake up a bit. By this point, I was really enjoying swimming even in the rough waters but I realized that France was still far away after 14 hours of swimming. I usually swim one way in 14 hours but Ishii told me that this time I would have to swim for another four hours to reach France. I realized that I must have drifted a long way off course when I was swimming near Dover and kept seeing the same scenery. Consequently, it took me 17hours 18minutes to swim just one-way. I told Ishii that it would be impossible to finish two-way because the first leg had taken too long but he encouraged me to swim a little longer. I swam for three more hours before I asked him if I could give up. Ishii said that the weather conditions were going to become better so there would be no wind or waves so I had better keep swimming as such good conditions were very rare. He told me that I could complete the swim in just eight more hours in such favorable conditions. I was determined to swim for another eight hours. I tried very hard, spurred on by the though that my dream of swimming the two-way Channel crossing was about to come true. My husband, the pilot, my colleagues, everybody would be delighted! What would I do if TV reporters were waiting for me at Narita airport? What would I do next after my dream had come true? Maybe I could try to swim the one-way ten times! Or perhaps I should try to become the oldest Channel swimmer! Pondering over these random things, I pushed myself to continue swimming. My body ached and I wanted to give up many time but I kept my arms moving. Night came again and it became cold but I didn’t stop. I saw the lights of England as I swam closer and closer to England. I drank another feeding and said to the people on the boat that I could not swim any more but they told me to keep trying. I screamed and my voice echoed in the darkness over Channel. It was the first time that my body was chilled to my very bones and even my wrists started to ache. I gave up about 5 hours from England (about 4 miles). I was mentally and physically exhausted. I could not swim the last five hours. I recalled my first Channel swim. That time, I was also unable to swim the last few hours. I could see the white houses on the French coast but just could not swim. I realized that I had not followed Freda’s good advice. I had looked ahead and convinced myself that the end was too far away for me to keep swimming. If I had continued to swim very slowly, I might have been able to finish the swim but, because I was tired, I convinced myself that I could not do it. To be a successful long distance swimmer, you have to be mentally strong. I had swum 30 hours in pool and 20 hours 7 minutes in sea. Even though it was tough, I am glad that I did not stop after just one way and challenged myself to my limit. next Channel swim. On my first swim, I stopped after just 10 hours but now I was able to swim for about 29hours 30minutes. I never dreamed I would be able to swim for so long. I am so grateful to the people who have helped me to come so far. I could not have done all this by myself. Thank you very much for supporting me. I hope that I will soon be able to fulfill my dream of completing the two way swim and will continue to enjoy swimming. What a great spirit of “gambaru” and self-transcendence! August 2nd looked like a swim day, finally. And it was the middle of the neap tide! Quite a few boats went out around 8 a.m., with several swimmers intending to attempt a double crossing. But the wind would pick up again to 15-20 knots (windforce 4-5). Marcy totally enjoyed her swim in the waves, touched France in 11 hours 31 to complete her 10th solo crossing (including 2 2-way), turned round to start on the second leg and see how things would develop, but then stopped after an hour or so when the waves got so high they were rolling her on her back and it became dangerous. “I had a blast,” she writes on her blog. Lianne Lewellyn set out for a double crossing, too – in what turned out to become atrocious conditions that tested her to the limit. She completed the first leg in 11 h 20 min and turned back to battle the waves for anouther 16 hours plus – with the added difficulty of swimming through the night. Carried off course by the currents and strong winds she finally landed at St. Margaret`s Bay way east of Dover, totally exhausted, after 27 hours 35 minutes of uninterrupted swimming – except for the short moments on French dry ground. What an achievement!